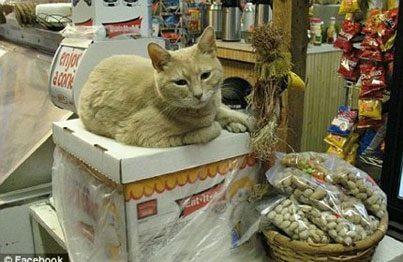 If you think the current presidential election has gotten catty, know that Barack Obama and Mitt Romney have nothing on Talkeetna, Alaska -- where a feline has been serving as mayor for the last 15 years. Stubbs the cat has been presiding over the sleepy Alaskan town since he was just a kitten. The Stubbs' political ascent was the result of a dispirited mayoral campaign, when a majority of Talkeetna's 900 residents -- unhappy with the available prospects -- encouraged their neighbors to elect Stubbs as a write-in candidate. The part-Manx kitty, who was only a few months old at the time, emerged victorious and has held the job ever since. Even though Stubbs' position is honorary, he's served a real function in the town: catapulting it into a tourist destination as word of his election steadily spread through the country. Related: Find a Cat Breed! Curious what a day in the life of a feline official is like? According to residents, Stubbs spends most of his time at Nagley's Store -- which now doubles as his town hall -- presiding over patrons and constituents from the countertop. Nagley's employee Lauri Stec told KTUU-TV that dozens of tourists stop in each day requesting a meeting with Mayor Stubbs -- and maybe even some cuddle time. With Romney on the prowl for a Vice Presidential candidate, who knows? Maybe Sarah Palin will lose her place as the most famous politician to come out of Alaska.